Do you want to become the best version of yourself? Maybe you have goals you want to accomplish and a vision of your ideal future. Or maybe you just know you want to improve and be the best you can be. If so, you’re looking to develop self-mastery. You achieve self-mastery by clearly understanding who you want to be and making that dream a reality. Although it’s an arduous journey with many roadblocks and distractions, personal mastery is a worthy objective. You can find happiness, personal fulfillment, and financial success if you set your sites on meaningful targets and continually strive for their improvement. The self-improvement industry has exploded over the last few decades and personal development is more achievable than ever before. The second part of this process – learning how to improve – is now attainable to anyone who wants the information. But you still need to put in the hard work. A life of meaning and happiness is within your reach if you want it. 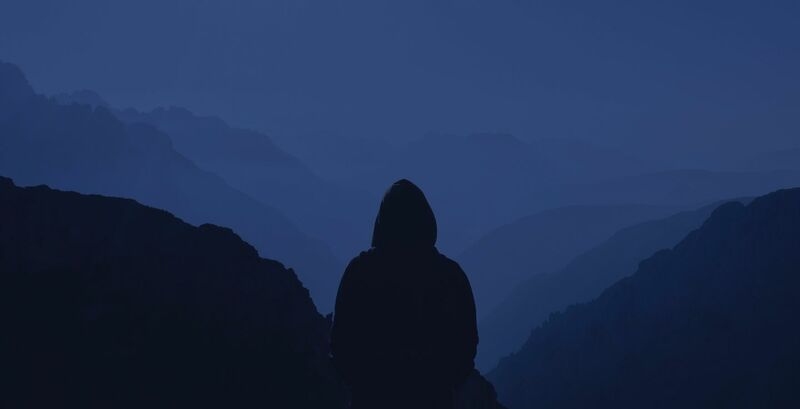 Follow the four-step process below to control your destiny and achieve personal mastery. Before you begin your journey to develop self-mastery, you need to figure out what you truly want to accomplish. This sounds like an easy task, but it takes personal digging and self-awareness. Self-mastery requires the continual development of a passionate and pleasurable skill set. Often, this skill set will add value to other people or organizations. Although, like artists who paint for their own desires and not the approval of others, it’s not necessary. You can only find your path if you’re completely truthful with yourself. Self-honesty is crucial if you want to find happiness with your direction in life. Do this by listening to your emotions and answering deep questions. What makes you feel good? What do you truly enjoy doing? If you had all the money in the world, what would you spend your time doing? You’re striving for pure awareness. Beware the white lies you tell yourself to avoid cognitive dissonance. Instead, find the activities and beliefs in your life that don’t align with your ambitions and values and remove them. Find the ones that make you feel alive and go after them. Be honest with yourself. This is how you find your calling. When you listen to your true, inner desires, you’ll discover your calling so you can pursue personal mastery. Self-mastery is a never-ending adventure. A true master understands there is always more to learn. Finding the information to learn your desired skill set is not difficult. You may have to perform research and sift through bad advice, but you’ll find what you need. The more important aspect of your learning is your mindset. Always have a beginner’s mind, even as you become an expert. Do this by testing new ideas, learning different theories, and questioning your existing knowledge. Instill constant curiosity into your way of thinking. Learning takes time. You’ll hit plateaus at times and your growth will make leaps and bounds at others, but you want to aim for steady progress over the long-run. Avoid burnout but keep chugging along by making education a daily habit. The most important component of learning is feedback, which you get from two main sources. The first source is the results produced by performing or practicing your skill. If you want to master cooking, how did your meal taste? That is critical feedback. The quality of this feedback depends on your ability to judge your results, which will improve over time if you keep educating yourself. The second source of feedback is through other people – ideally those who are masters themselves. Coaches and mentors are excellent sources of feedback because of their extensive knowledge. They will point out your flaws and teach you how to improve faster than any other method. But don’t discount the value of an audience or peer. Even with limited expertise, they can provide valuable feedback and help you grow faster. Listen to your instincts though. Don’t blindly accept advice and use your best judgment to decide if a critique is valid. Learning how to achieve your goals is an essential step of self-mastery, but it’s easy to let it get in your way. Learning shouldn’t take precedence over action, where the real learning and accomplishments take place. Once you know what your goals are, you should spend about ten percent of your time learning how to do them, and ninety percent of your time working toward them and practicing your skills. Now that you know what you want, and you know how to get it, you need to put in the effort necessary to achieve your goals. Self-mastery takes hard work and there are no shortcuts. As mentioned in the last section, shoot for steady progress. This will only happen if you show up day after day and get to work. Do you want to be the best writer you can be? Sit down and write more than 1,000 words every single day. Do you want to be the best teacher you can be? Find students and teach every single day. It doesn’t matter what your goal is. You can only learn so much from reading, watching videos, and completing lesson plans. You must do the thing you want to master, even when you’re terrible at it. In the beginning, you’ll be horrible. That’s okay. For a while, you’ll be pretty bad. That’s okay. You won’t be great for a long time. That’s okay. If you can learn to enjoy the process, the sky’s the limit. Self-mastery requires inner strength. Without self-discipline and self-control, seductive distractions will steer you away from your duty and you’ll never achieve the level of sophistication you desire. That’s why it’s so crucial to know exactly what you want. You need the ability to determine whether something is important or distracting. Self-awareness and honesty will help you make these decisions. Use your strength to build a daily habit of doing and practicing your craft. Not only will you get better at your favorite skills, but it will have a ripple effect on the rest of your life. You’ll notice you only spend time on activities that are important to you, which makes you happier and more successful in all your endeavors – if you have the right mindset. None of this matters if it doesn’t make your life better. And the quality of your life is largely determined by your mindsets and the way you see the world. For starters, you can’t be dependent on a specific outcome. That’s a recipe for depression. Too often, people chase mastery for the benefits others received from it. They see how many fans a famous singer has, so they want to sing. They see their friend make more money working only 10 hours per week, so they want to get into internet marketing. This is disastrous. Although many benefits often come from self-mastery, they cannot be the reason for it. You need to appreciate the direct benefits of the skills you’re developing and enjoy the process. For example, if you want to become a master architect, don’t do it because you want to be a rich and famous architect. Do it because you love designing beautiful, elegant, efficient, effective buildings that fulfill specific purposes. If you can make peace with yourself when you receive no income or praise for what you’re doing, you’ll be much happier. Self-love is an under-appreciated concept. What’s the point of striving for greatness if you can’t love yourself in the process? The whole reason for self-mastery is to make your life better. If you can enjoy the process and love yourself while doing it, happiness and success will likely follow. All of this advice may seem like common sense, but people rarely put it to use. If you work toward personal mastery, you’ll outperform your peers by a large margin. Put effort into figuring out what you want, then learn how to do it and keep learning. But spend most of your time putting in the work. If you can do that, while loving the work and yourself in the process, you’ll achieve your highest level of ability possible. Are you already working towards self-mastery? What skills are you trying to master? Let us know if the comments below! YOU DON’T NEED TO WORK HARDER. YOU NEED A MORE EFFECTIVE DAILY / WEEKLY / FOREVER PLAN. We used to be just like you. A few years ago, we were running a total of three businesses — Cathryn had hers, Allen had his, and we ran a joint venture together. So yeah. We had a lot on our plates. We were working harder than ever, but we both felt like hamsters on a wheel. And worst of all, we weren’t having any fun. We wanted to take back our time. To have clear direction on who should be focusing on what, and when. To feel that all our hard work actually meant something. We wanted to make meaningful progress in our business and lives — every. single. day. So we did what any overachieving business owner would do — we made one from scratch. That system eventually became our first product, The SELF Journal, which is now in its 3rd edition, with over 10,000 units sold. Since then, we’ve developed dozens of additional products, won multiple awards, and been featured in Business Insider, Inc, Huffington Post, and more. We even recently got endorsed by Daymond John of Shark Tank, who called our product a "must have for all entrepreneurs." 1.High achievers (like you) tend to take on TONS of responsibility. And without a tried-and-true system to manage it all, they (you) end up on a fast track to overwhelm. 2.The Journal is just a tool; one small (but awesome) piece of the productivity puzzle. We knew we needed to offer something more comprehensive. We’ve spent years studying and learning from the most successful, high-performing people in the world, modeling their strategies and habits, keeping what worked, and ditching what didn’t. What we found was that most of the existing productivity / personal development systems failed to address one of the core problems that got you into this situation to begin with. Namely, how’d you get so much crap on your plate? Figuring out how to manage your day-to-day responsibilities is nothing to sneeze at. But unless you offload a good chunk of them — permanently — you’ll never free up the time (or headspace) to focus on your REAL priorities. And without a solid system in place to keep your schedule free of all those unnecessary time-wasters, you’ll end up right back where you started. This online course is the culmination of all the systems, strategies, and habits we’ve studied and practiced over the years. That includes books, personal coaches, high-level planning systems, project management software, journals, calendars, morning routines, evening routines, workplace configuration, instant messaging platforms, and everything in between. Phew! We’ve studied under the top experts in the field, and made their teachings our own. 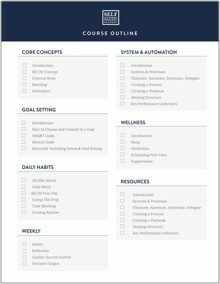 When we designed this program, we were super conscious of avoiding the “to-do-list trap” — that’s when your shiny new planning system becomes another thing to achieve, another problem to conquer, another “to-do” on the never ending list. We want to make sure you don’t bite off more than you can chew (that’s why we’re all here in the first place), so we broke the course down into six easily digestible modules. The biggest distractions and productivity pitfalls in our “busy-ness” culture — and what to do about them. How to set daily, weekly, monthly, quarterly, and yearly goals— the RIGHT way. The value of stretch goals, and how to find the balance between pushing yourself and setting realistic goals. How to preserve your mental & physical energy by reducing the amount of decisions you make in a day. What you can do to break the cycle of procrastination → beating yourself up → declaring yourself a failure → giving up and binging Netflix instead. How to build a time machine! A.K.A the systems and automations that we’ve used to scale and grow our business, eliminate repetition, and maximize our time & efficiency. A super easy tracking system so you can measure your overall performance and growth, tweak what’s not working, and celebrate your wins. Why your physical well-being is key to your success, and how you can tweak your daily routine to up-level your health. It’s time to take back your time. Stop giving so much of your day to things and people you don’t really care about. Reclaim your focus. And trade in your overwhelm for a feeling of satisfied completion. Life will never stop being stressful. Other people aren’t going to magically stop asking you for things, or scheduling meetings during your “me” time. Emails won’t (ever) stop coming in, and those weights aren’t going to lift themselves. 10x-ing your productivity isn’t about doing more in less time — it’s about learning how to discern what’s truly important, and filtering out everything else. It’s about owning your time, and protecting it from other people’s agendas. You are the only one who can take control. The SELF Mastery Academy will show you how to do it. These 6 simple modules are available in both video and written form, so you can learn in the way that works best for you. The course workbook is filled with step-by-step training, done-for-you templates, key action steps, and a comprehensive resource list if you want to learn more. You’ll be able to watch and learn at your own pace, on any device — even on your phone! Long, boring presentations are a drain on your attention. And when you’re bored, you’re not absorbing the information. (Plus, they’re no fun.) We want you to be able to take fast, decisive action — so we broke each module down into easily digestible, bite-sized pieces. This makes it easy for you to jump in and out of the course, picking up where you left off. Everyone’s learning style is different. This multimedia course allows you to pick and choose how you want to consume the material, with quick videos, PDF transcripts, downloadable checklists, and linked resource guides. Our program makes it easy to log your progress by keeping track of which modules are complete and which assignments are still left to do. It can even send you reminders so you don’t go astray. WHAT’S MY INVESTMENT FOR THE SELF MASTERY ACADEMY? It’s difficult to pin down the costs of your scattered productivity and attention-eating distractions (But time is money — so it’s definitely costing you). The better question is — how much is your time worth? You can make back the money you spend, but once you spend your time… it’s gone forever. Time is your most precious resource. What would you pay to get it back? 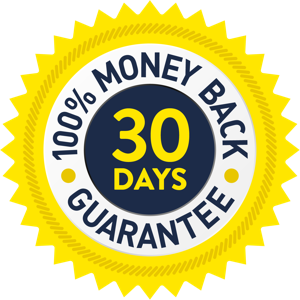 We’re dedicated to your success, so if you aren’t experiencing a higher level of performance in your life and business, and on your way to accomplishing your big vision goals, we’ll refund your investment 100%. Our 30-day refund policy lets you try the entire course risk free. Apply the same systems that top performers and entrepreneurs use to strategically design their lives for success. If, for some reason, those systems don’t work for you, we’ll refund your investment. No questions asked. How can I be sure the the Self Mastery Academy will work? We’ve spent years studying, implementing, and trial-and-error-ing every productivity tool we could get our hands on. This includes books, personal coaches, high-level planning systems, project management software, journals, calendars, morning routines, evening routines, workplace configuration, instant messaging platforms, and everything in between. Phew! In other words — we’ve personally tried it all. We’ve studied under the top experts in the field, and made their teachings our own. Our system is the drilled-down version of all that experience, distilled into a simple, essential system that you can tailor to your own lifestyle and needs. How do I know the Self Mastery Academy is right for me? If you have a big vision and audacious goals, but you struggle with translating that vision into a day-to-day plan in a way that truly moves the needle — you’re in the right place. If you’re driven and hard-working, but you know there’s a better way of doing things — that doesn’t involve “hustling” your way to exhaustion and burnout — you’re in the right place. If you’re ready to learn, but more importantly, to take action and adopt a proactive role in designing your own life — you’re in the right place. The Self Mastery Academy is a 6-week video program delivered to you by Cathryn and Allen, the founders of Best Self Co. (That’s us!) We’ve personally recorded the videos for each module, along with actionable advice that you can apply to your life and business as you go. Each module is easily digestible, to avoid overwhelming you with a ton of information that’ll paralyze you into inaction. Once you complete your purchase, you’ll receive access to the entire course. Every module consists of one video, plus a workbook section that contains a written transcript, as well as all the templates, action steps, and references you’ll need for that module. We’ve made it super clear, with instructions and prompts to take you from one step to the next. We have a suggested weekly curriculum, but you’re free to go at your own pace and revisit lessons when you need them most. What can I expect from the Self Mastery Academy Facebook Group? 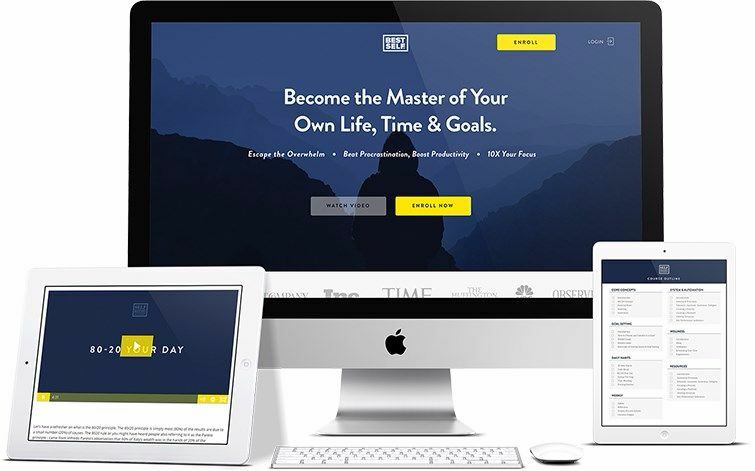 The Self Mastery Academy Facebook Group is your go-to place to connect with like-minded top performers and entrepreneurs, who share a common desire to become the best versions of themselves. Your admission to the group is covered by your tuition for the Self Mastery Course, and it’s yours for life. Will I have access to you guys? We are active participants within the Facebook group, and often share our own struggles and wins on this entrepreneurial journey. But it’s the community’s collective wisdom and problem-solving power that’s truly amazing. The more you participate in the group, the more you’ll get out of it. What if this course doesn’t work? If — after you learn and apply the concepts that we teach inside the Self Mastery Academy — you don’t see real results in your levels of productivity and discipline, and don’t have a concrete roadmap to achieve your high-level goals, we’ll be happy to refund 100% of your investment. Our 30-day refund policy lets you try the entire course risk free.